The region’s biggest celebration of business begins on Monday 29 October. Now in its fourth year, the annual Leicester Business Festival fortnight will see over 100 completely free events taking place all around Leicestershire. The Festival comprises 119 individual events run by independent businesses and organisations under the business Festival umbrella. The programme is packed with everything from workshops, seminars and trade exhibitions to roundtable discussions, premises tours and awards evenings. There is a huge choice of subject matter including an abundance of marketing, communications and business support events as well as professional and financial services, which will have a wide appeal across the board. More niche events include those in the space sector, life sciences, property and construction, logistics, tourism and retail and much more. All the events can be seen on the Festival website www.leicesterbusinessfestival.com or through the new LBF App – free to download from Google Play or the Apple Store. 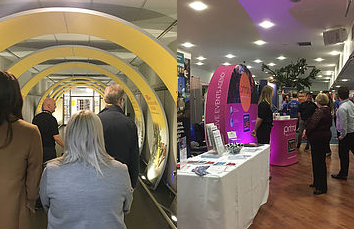 Scott Knowles, Chair of the LBF said: “The Leicester Business Festival really shows off the diverse and colourful business community of Leicester and Leicestershire. “The programme contains something for everyone, whether they are a small or micro business wishing to find out more about tax relief, how to access finance or develop a website for example, right up to medium and larger businesses that perhaps wish to review their mental well-being policies, start trading with China or initiate an apprenticeship programme. The Leicester Business Festival partnered by Leicester Castle Business School, is the region’s largest business event with around 10,000 attendees anticipated to attend. The majority of events in the Business Festival are completely free and anyone can attend. Tickets are available on a first come, first served basis and must be reserved. Along with headline partners, Leicester Castle Business School, the 2018 Festival has the support of well-known business organisations including East Midlands Chamber, LLEP Business Gateway, East Midlands Airport, Brewin Dolphin, University of Leicester School of Business, Highcross, the FSB and Shakespeare Martineau. Other supporters include Everards Brewery, De Montfort University, Pattersons Commercial Law, Growth Partners PLC and the Institute of Directors, as well as official app partner Infonote, AV media partner The Presentation Group, coffee partner 200 Degrees and media partners Cross Productions and Capital Radio.